Some upsets occurred in round 15 , of the AFL Home and Away Football Season . Richmond , despite being very competitive for most of the Season , where thrashed by the mercurial Kangaroos .Essendon beat Port on Sunday , but at the high cost of losing captain Jobe Watson , for at least a month through injury . St Kilda , rejuvenated by Lenny Hayes' return , played some good footy to test Freo in the West , but ultimately Freo took the points . Arch rivals Collingwood and Carlton battled on friday night , with the Pies being victors , despite the absence of Harry O'Brien , who has reportedly had an argument with coach , Nathan Buckley . Geelong , who are second spot on the ladder beat top spot team Hawthorn , whilst the Bulldogs narrowly defeated bottom dwellers GWS . In the Queensland Derby the Lions were triumphant over the Suns , and the Eagles narrowly defeated the Crows . Drugs , fights on and off the field , losses by winners , and wins by losers , equals AFL Footy action . Talk is rife as to who will make the final eight to play off in the Finals . 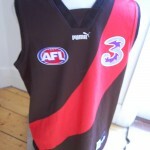 Fans are revelling in the action , the notoriety and spectacle of AFL Footy wearing their football jumpers , jerseys , guernseys. 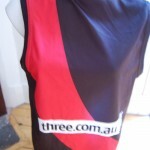 This entry was posted on Monday, July 8th, 2013 at 10:58 am	and is filed under AFL, football jumpers, NRL. You can follow any responses to this entry through the RSS 2.0 feed. Both comments and pings are currently closed.